Experience both sunset and sunrise from our camp close to Trolltunga, with spectacular scenery of the Lake. 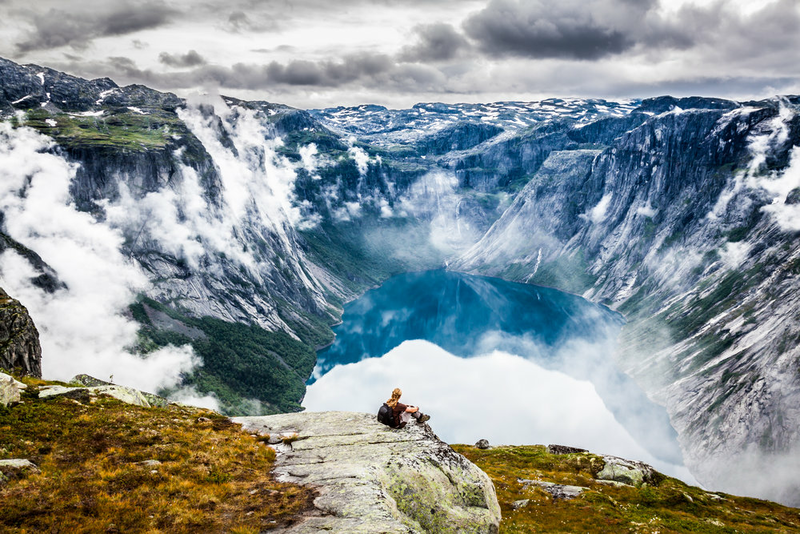 We have a beautiful campsite not far from Trolltunga, with stunning views. Here you'll find the original Pulpit Rock (Preikestolen), which was the main attraction in «the old days». It’s a stunning cliff that’s almost forgotten and for us it is as magical as the more famous Trolltunga. We'll prepare and serve traditional norwegian dinner while you relax around the campfire while enjoy the beautiful scenery. We also invite all our guest to do an optional small hike at night, it is a little steep but the view over the Hardangervidda Plateau is magnificent if the weather permits. The hike start at 11.00 at Skjeggedal parking lot, following the trail up to Gryteskar with great views of Folgefonna Glacier. On the way, we'll serve you a classic Norwegian mountain lunch. We should be at the cliff around 17.00, depending on the pace. At night we prepare our famous Reindeer-stew, with rice and lingonberry. At night you can relax at the tent or we will serve you hot tea/coffee or toddy around the campfire. We wake you up early next morning for breakfast and coffee/tea. After breakfast, we walk back to Trolltunga before we start our way back to civilization. We should be back at the parking lot between 14:00-1600, depending on the pace. We'll provide all you all the equipment. Tent, sleeping bag, sleeping mat, food, coffee/tea. All you need is a backpack, warm clothes and some snacks for the second day. Our main goal is that everybody gets an extraordinary experience, which you will never forget by introducing you to the Norwegian mountains. Whether it is the reindeer stew, catching of a mountain trout, the swim in 5 °C waters, or watching the sun set behind the glacier - we always make sure that everyone has a once-in-a-lifetime adventure!